Accepting phone orders for goods and services has been a traditional business function for a number of years. The intelligent routing of calls to the appropriate sales person is a simple task for our call center phone system. But our Retail Sales Phone Technology goes far beyond connecting prospective customers to sales representatives. 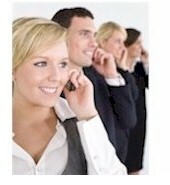 Information can be collected from the caller prior to connecting to your sales agents. In fact, the entire order process can be programmed without the customer talking with a sales person. Product availability, pricing, and order status information can all be given to the customer using simple touch phone responses. This article appeared in RetailerNews.com. Your business likely gets phone inquiries... people calling about prices, product info... some with downright dumb questions. And if you're like most businesses, you probably are losing business because these calls aren't being handled as well as they could be, particularly on the follow-up. Here's a case study you can pick up some ideas from: Fairfield Processing Corporation sells fluff. No, really. They do. The fluffy stuff that goes in pillows, quilts, even teddy bears (scientifically called Poly-fil-R�). Gina Kuchta, one of the sales reps, contacted me looking for help, and explained the existing sales process and tactics. Most of Fairfield's new prospects are phone inquiries resulting from people who've either heard about, seen, or used the product. (Fairfield also sells through distributors, and their phone number is on the packages.) Typical prospects and customers are Ma & Pop crafters working out of their homes looking to save a buck wherever they can. However, they also have many larger customers who mass produce. On the incoming call, reps ask questions to learn about the prospect's business (Gina did mention they could expand on the questioning and subsequent sales opportunities. I agree and will address it later). A package of fluff then goes out (I couldn't resist that). Actually it includes pricing, product and company info. They place a follow-up call about two weeks later, and that's where the difficulty comes. Gina asked for help with her opening, which she characterized as weak. "Hi, _______, this is Gina Kuchta calling from Fairfield Processing in Connecticut. About two weeks ago you had phoned/written to us requesting some information regarding our Poly-Fil products. I'm just calling to make sure that you received it?" Since she wasn't lighting anyone's fire with that, she was desperate for something stronger. After discussing the matter by phone, we came up with a few ideas. The main problem isn't with an uninspiring follow-up call opening. That's like saying the Titanic sunk because the teaspoons used to bail water out weren't big enough. The problem is with what happens or doesn't happen on initial calls, leaving sales reps nothing of substance to work with when trying to come up with a good opener on follow-ups. We need to squeeze all the potential we can from that initial call, and I suggest several tactics to do so. Granted, you might not close a sale with everyone on this call, but why not start there as a primary objective. After all, if they're calling about fluff, and they've used your exact same stuff(ing) before, why do they need to see something else? I've seen too many reps create unnecessary work by feeling (wrongly) that they needed to stretch out the sales process over several calls, because they should always just send out material on a first contact. Hey, go for the gusto. These people called for a reason. If the need is there, don't prolong the process. That would be like a cashier at a retail store telling customers in line, "Go home with the price list and a few brochures, and then, in a week-to-ten-days, let's get back in touch." Question with CIA-like depth. Bottom line, will they buy or not (at some point), find out when, in what quantity, and how often. "How much do you use now? ""How much are you planning on using within the next year?" "How are you selling your stuffed rhinoceroses now?" "So if the Wal-Mart deal goes through, how many do you think you'll sell per year?" If they do need to see your material first, ensure they're a player. Learn their decision-making criteria, and what they'll do and when. "What will you look for in the sample? ""How will you decide between us and Foam-R-Us?" "Who else will evaluate it? ""By when will you have a chance to look at it?" "When do you need the material?" "If the sample meets the requirements you mentioned, will you buy from us?" "Can we be your supplier? ""Will you be ready to set up an account the next time we talk?" If everything's sailing smoothly, build the anticipation by preselling them on what you'll send, so they have an idea of what to expect, and of what to do when it arrives. "Mary, I'll send you a sample of our pillow insert in the two sizes you need. You mentioned you want inserts that retain their shape under pressure. Well, these are the best you'll find. I'd actually like you to test these by putting them under a concrete building block for a couple of hours. Do you have one available? Great. Then notice how well it snaps back and retains its cushiness." Assuming everything discussed thus far was executed flawlessly on the initial contact, it would be a breeze to assemble a smooth introduction. "Hi Mary, it's Gina Kuchta with Fairfield Processing, calling to continue our conversation from last week, where we discussed our inserts for your new line of Barney pillows. If I caught you at a good time, I'd like to discuss your evaluation, plus I have some additional information I came across on marketing through consignment stores that I thought you might find interesting." Notice that there's something new at the end of the opening. I suggest that on every call you bring some additional value to the table. The quality, ease of development, and subsequent success of any follow-up openingand call is directly dependent on how well the previous call set it up. Focus more on the initial call, and the follow-up is a breeze. Art Sobczak helps salespeople use the phone to prospect, service, and sell more. Get a free subscription to the TelE-Sales Hot Tips of the Week by sending e-mail to: telesales@businessbyphone.com with "join" in the subject line. Also get other free sales tips, resources, and special offers at http//:www.businessbyphone.com/ You can also call 800-326-7721.